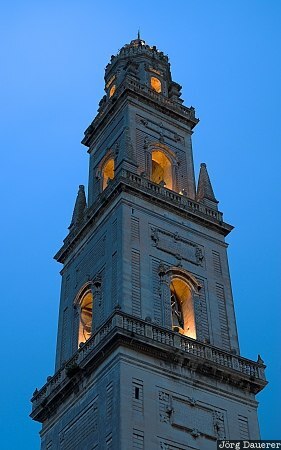 The floodlit Campanile (bell tower) of the Duomo (Cathedral) in Lecce at the central Piazza del Duomo seen at the blue hour just after sunset. Lecce is in Apulia (Puglia) in southern Italy. This photo was taken in the evening of a rainy day in April of 2006. This photo was taken with a digital camera.